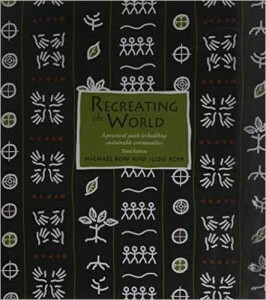 Rooted in decades of work with indigenous communities in the Americas, as well as extensive experience in Africa, Asia, the Pacific and the former Soviet Union, "Recreating the world" is really two books woven together. The first is a down-to-earth exposition of models, principles and strategies for understanding what community development is and how it can be promoted. The second is a rich collection of stories, games, activities and tools that can be used to help others to learn about various aspects of community development practice. In this book, building sustainable community is presented as a primary strategy for solving critical human problems. Community building is not merely viewed as a means to an end, however. Sustainable community is a basic human need, and in its absence, human life becomes distorted, painful, and often self-destructive.